Social and political sphere of Himachal Pradesh, a peace-loving north Indian state, is echoing with horrors of Yug Gupta murder case – kidnap and killing of 4-years-old son of a Shimla businessman for ransom. 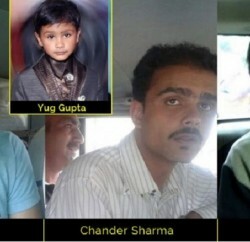 Yug had disappeared from near his house in Ram Bazaar and his disappearance remained mystery for two years before his skeleton was recovered from Kelston-based municipal water tank on information provided by first accused, Vikrant Bakshi, who was arrested by Central Bureau Intelligence (CID) from Chandigarh. It was followed by arrest of two other accused, Tijender Singh and Chander Sharma. Investigation revealed shocking chain of events that included abduction, torture, and eventual killing of the child by throwing him alive into 12 lakh litre capacity Shimla MC Water tank. 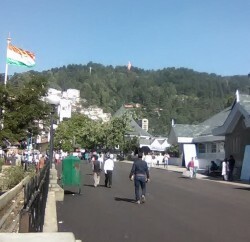 The case put police department and Shimla Municipal Corporation (SMC) in a highly questionable position. Police couldn’t trace the boy despite having strong lead provided by the parents, and was eventually handed over to CID. On the other hand, SMC’s claims of supplying safe drinking water were proved false twice this year only. The accused had dumped the boy in the tank on June 22, 2014, and during this period SMC claimed cleaning of tanks as many as five times. In 2016 only, MC claims, water tanks were cleaned in June and January. MC clarified that it was mistaken as skeleton of monkey, hence, was not reported to anyone. SMC supplied drinking water to posh Kelston area and some regions of Bhatakuffer including VIP residents and Judges Colony from the tank. CID has sent its report to police seeking FIR against SMC officials for such carelessness. In wake of it, some of the officials can face stringent action, if found guilty. During investigation, the accused admitted their crime and told agency that they had planned and kidnapped Yug on June 14, 2014, and had hid him in a rented flat near Ramchandra Chowk for nine days. The plan was to extract ransom. However, accused killed him before sending first ransom letter. Family received first letter on June 27, 2014 in which Rs. 3.60 crore were demanded as ransom. It was followed by three more letters in which kidnappers raised the amount to Rs. 10 crores and back to Rs. 4 crore. Ransom letters stopped when the case was handed over to CID. In investigation, accused admitted that innocent Yug was forcibly made to drink alcohol to keep him unconscious, was starved, and even tortured before he was tied to a heavy stone and thrown into the tank. CID also recovered photos and videos of naked Yug crying for help from the mobiles of accused. CID created entire crime scene in chronological order and found that the boy was tied with tape and put into a box to be transported to the mentioned flat. All accused are local and are from well to do families. One of the accused Chander, even won trust of Yug’s family and managed to accompany police search parties claiming himself to be a member of International Human Rights Commission. 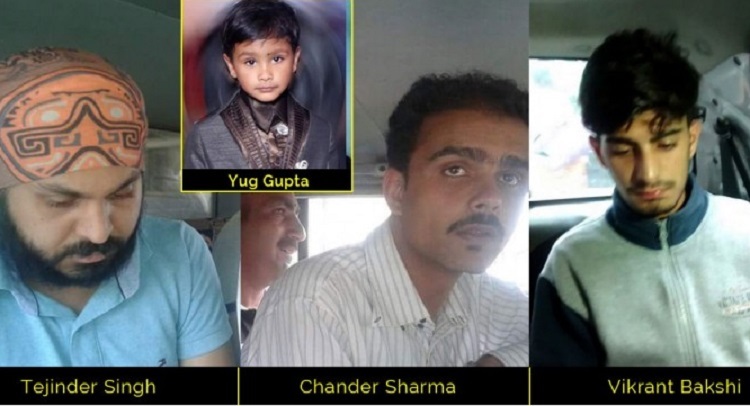 During last two years, Chander remained aware of every discussion and plans formed to search Yug and trace kidnappers that provided the culprits upper hand. It was only a year after that Chander came under suspicion of parents for taking too much interest in details regarding wealth and assets of Vinod Gupta, father of Yug. CID arrested Tejinder and Vikram on June 2016 for the first time, but both accused managed to secure bail. However, when the accused denied taking lie-detection test, CID’s suspicion grew stronger. CID increased its surveillance on two accused and managed a breakthrough by arresting Vikrant Bakshi from Chandigarh on 21 August, 2016, who admitted the crime and told CID about the location where the boy was dumped alive. The investigation still continues as CID is trying to dig deeper to find more facts, evidence, and trace more people, if any involved in the case. Hearing brutality against 4-years-old innocent child, anger erupted in people who staged protest and met Chief Minister Virbhadra Singh and the Chief Justice seeking justice. On Saturday, two accused, Tejinder and Chander, were thrashed by enraged mob at Shimla District Court Complex. Considering the threat to safety of accused, security has been increased. The issue of carelessness on the part of SMC and false claims of cleaning of tanks reached HP Assembly during ongoing session. BJP MLA Suresh Bhardwaj and Congress MLA Anirudh Singh on Wednesday demanded dissolution of SMC in wake of discovery of Yug’s remains from its water tank. Congress also opened attack on the SMC officials, Mayor and Deputy Mayor and demanded action against the erring corporation officials. The anger among people expressed itself in a call made for social boycott of the families of the culprits. Allegedly, Tejinder and Vikrant Bakshi were earlier arrested in a case of theft and their families had extended support to rescue them, and they did the same when secured bail second time in June 2016 in the Yug murder case. Also, in wake of boycott from Lawyer community, the culprits are unlikely to find any reputed advocate as defense. The investigation still continues and CID has claimed a fool-proof case against the culprits claiming it has strong evidences in forensics. People are demanding capital punishment for all three accused for subjecting an innocent kid to brutality and cold-blooded murder. The case has also sent waves of fear among parents who are now feeling worried about security of their children.